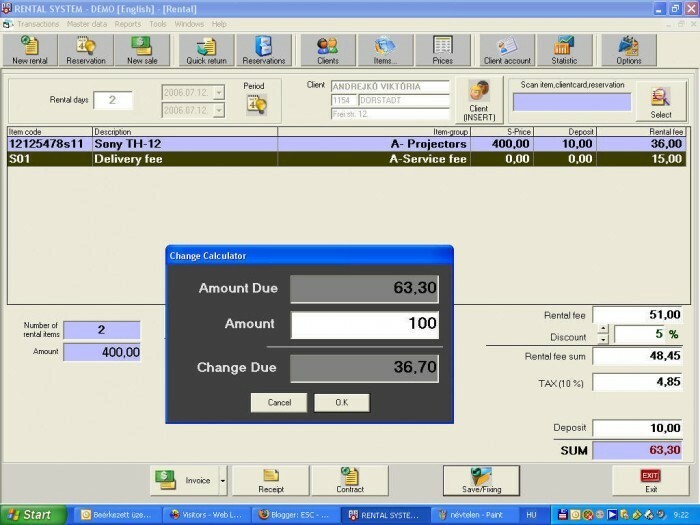 ESC - Rental Software (Rental and Point of sale software) is the latest Windows rental software solution forany sized companies in the equipment rental market from the Rental Expert. ESC - Rental Software is a complete rental software package that helps you process bookings, scheduling and invoicing of equipment rentals. Download today and start to make your equipment rental business more efficiently by using ESC - Rental Software, our rental management software; Simple and fast solution, low cost for rental & POS Software Why Use ESC - Rental Software? Manage Products, Customers, Transactions and Point-of-Sale (POS) and Rental Operations. ESC - Rental is easy-to-use, dependable, industry approved and used by thousands of stores. Solid Design, new features, business reports. Use your own or standard barcode of items. Normal and 80mm receipt printer support. Delivery or any service fee support. Creating your own price structure with daily & linear type. EU-USA address format,NON-PROFIT Rental options. Who Uses ESC - Rental Software? sport tools, machines, working tools, ships, yachts, delta, dresses, clothing, costumes, insturments, theater/event accessories, furnitures . . . Powerful Online Software for Renting DVDs.